However, for those new to Lovecraft, there are also aspects of the book which are more dubious. Although Roland’s aim of a “popular” book aimed at readers outside the “scholarly” networks is laudable, much of the work coming out of Hippocampus Press over the last couple of decades is essential to anyone wanting to grapple with HPL, and it’s not always clear how much of this Roland has engaged with for his book. There is a short bibliography, but Roland cites a number of other works which aren’t in it, and the book would have been better with an index. More importantly, perhaps, he seems to think that Lin Carter, author of Lovecraft: A Look Behind the Cthulhu Mythos is female (p. 188), which doesn’t at all invalidate what he has to say about Carter’s comments upon Lovecraft but is an odd error to make (my copy of the book clearly notes Carter’s gender) and implies a level of attention which I hope is simply just a careless misreading of an ambiguous forename. I’d also disagree—though admittedly this is personal taste, and when making literary judgements on Lovecraft we have to admit that an awful lot is personal taste—with some of Roland’s judgements. For instance in considering the Dunsanian “The Terrible Old Man”, Roland takes issue with “he did not like the hideous screams” suggesting that juxtaposing the mild “like” with the dramatic “hideous” is a sign of lack of revision—though this kind of juxtaposition is very Dunsanian. Likewise, he suggests that the “excess fat” between the penultimate and final paragraphs of “The Outsider” be trimmed—though I’d argue that this almost hysterical and parodic hesitation leading up to the “reveal” works well in the context of the story’s bombastic gothickry. Wisely, Roland holds back on some of the interpretation of the “Dreamer” tales as serious accounts of astral projection –Lovecraft as Theosophical mystic in this exact sense is actually undermining the serious undercurrents of loss and nostalgia in the stories which are what makes them, in the end, worthwhile. Another odd gap, though, occurs when Roland is rounding-up Lovecraft’s influence and reappraisal: missing in his account is any mention of Argentinian writer Jorge Luis Borges, himself one of the great twentieth-century fantasists, who has written several pieces on Lovecraft. At least one of his stories, “Tlön, Uqbar, Orbis Tertius” shows clear (to my mind) debt to Lovecraft. Nevertheless, the story that’s told in Roland’s account is one which it is worth paying attention to. 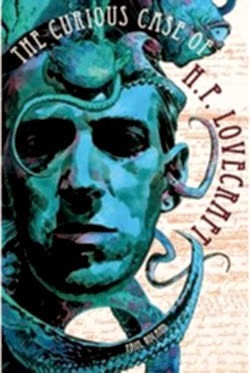 While he skips over some aspects of Lovecraft’s life which are overlooked by other popular accounts and which ought to be engaged with—such as the development of his political views over his lifetime—the oddities of his upbringing and his domestic life and how this might have impacted on his fiction remain a fascinating narrative if a minefield for the amateur psychologist. He skewers a few myths which are still part of the popular vision of Lovecraft—such as Lovecraft the “recluse” (it’s a shame the back-cover blurb still has this one!) and he seems to come across sensitively in covering the story of Lovecraft’s marriage to Sonia Davis. Indeed, out of the many puzzles of Lovecraft’s life comes this: his relationship with women. So many accounts of Lovecraft’s life have (deliberately or not) his mother and aunts as the villains of the piece, warping the mind of the young Howard and instilling in him both an emotional dependence and the conviction that he was a genius. Roland doesn’t seem quite to buy into this. Unstable, Lovecraft’s mother clearly was, but she was unstable because she had lost her husband and the family finances had fallen apart: and Lovecraft certainly ascribes some of her indulgence of him as a child to his demanding behaviour. Similarly, his aunts’ rather foolish insistence on their Puritan respectability (even though that seemed to have been the deciding factor in driving Sonia away from him) seems, in the context of their straitened circumstances, considerably more rational than HPL’s invention of himself as “Grandpa Theobald” the Anglophile. And what are we to make of Sonia, clearly from her account of her life with HPL (part of which is reprinted here as an appendix) an intelligent, independent and cultured woman who nevertheless thought Lovecraft was a genius and married him at least partly to reform him from his antisocial ways (and whose account nevertheless provides much of the evidence against him)? Roland doesn’t give an answer, partly because there is no answer available to us. Interestingly, Sonia’s daughter from her first marriage (who became estranged from her mother) is reported to have thought that Lovecraft was a wastrel who married her mother to live off her: an interpretation which no other account of Lovecraft’s life can hold up, but which is certainly understandable from the outside. Perhaps Lovecraft was a genius, and Sonia really, truly believed that it could be her role in life to nurture him. Who knows? Roland doesn’t weigh upon all this, but his account has a certain poignancy which suggests that it interests him. Any account of Lovecraft is going to have difficulties for someone, but despite my caveats above I’d recommend this as a readable primary introduction to the writer. A good selection of illustrations and a final chapter on Lovecraft adaptations in film, comic books, music, games etc. make this useful, and three appendixes—Lovecraft’s “History of the Necronomicon”, his “Notes on Writing Weird Fiction”, and the Winfield Scott edit of Sonia Davis’s account of life with her husband all add value.